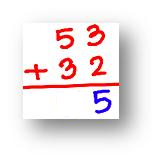 Here we will learn adding 2-digit numbers without regrouping and start working with easy numbers to get acquainted with the addition of two numbers. We are going to start working with the basic addition of two-digits with everything arranged because this is what we will always do with bigger numbers in future. How to add two two-digit numbers without carrying? Let’s follow the steps and start learning adding 2-digit numbers without regrouping with the help of an example. (i) Arrange the numbers vertically so that the tens' place digits and ones' place digits are lined up which means in simple one number should be written above the other number. (ii) Add first the ones' place digits. (6 + 1 = 7). (iii) Then add the tens' place digits. (2 + 4 = 6). (iv) The answer of 26 + 41 = 67. So, adding 26 + 41 = 67. Follow the steps of another example of adding 2-digit numbers. (i) Arrange the numbers vertically so that the tens' place digits and ones' place digits are lined up which means in simple one number should be written above the other number. Draw a line under the bottom number. (ii) Add first the ones' place digits. (3 + 2 = 5). (iii) Then add the tens' place digits. (5 + 3 = 8). 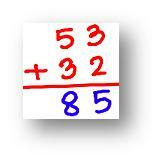 (iv) The answer of 53 + 32 = 85. So, adding 53 + 32 = 85.